Main photo: Huntsville’s Got Talent 2019 finalists (from left) Robert Attfield, Caleb Houser, Leah Church, Nyiah Blacklock, Holly Sewell, Luke Asher Murphy, Josie Robinson and Jack Nickalls of Jack & Josie, Briar Summers, and four-person band The Hillbirds. Missing from photo: Zack Fitzsimmons. It was a big night, made even bigger by the generosity of community. 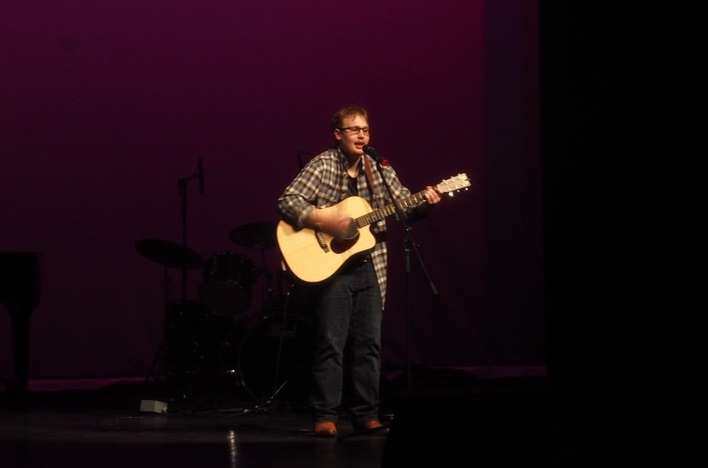 The third annual Huntsville’s Got Talent (HGT) brought a bevy of, well, talented performers to the Algonquin Theatre stage last night for an evening of crowd-pleasing entertainment. But they were there for more than just the chance to strut their stuff—each was vying for the judges’ votes, bragging rights and prize money. The event, which was started by Dr. Drew Markham, is a fundraiser for Community Living Huntsville. The organization, which promotes inclusion and supports people living with the label of developmental disability, took the reins of the show this year. Twenty audition tapes were submitted, with the finalists selected in advance by the judges and one chosen as a wildcard finalist by popular vote on the HGT website. Two additional finalists moved up to the big show from the Young Stars competition held earlier in the day for performers under the age of 12. After introducing this year’s judges—Sue Campbell, Beverly Mahood, Tom Cross and Andre Wahl—emcee Helena Renwick invited last year’s winner, contortionist and dancer Andrea Hill, to the stage for an eye-popping performance that included aerial silks and incredible displays of flexibility and balance. Then, it was on to the finalists. The Hillbirds, a four-person band who have only been playing together for a few months, performed an original song. Up next was 14-year-old singer and ukulele player from Gravenhurst, Leah Church. Fifteen-year-old singer-songwriter Briar Summers, who has participated in Huntsville’s Got Talent every year, followed with an original song. 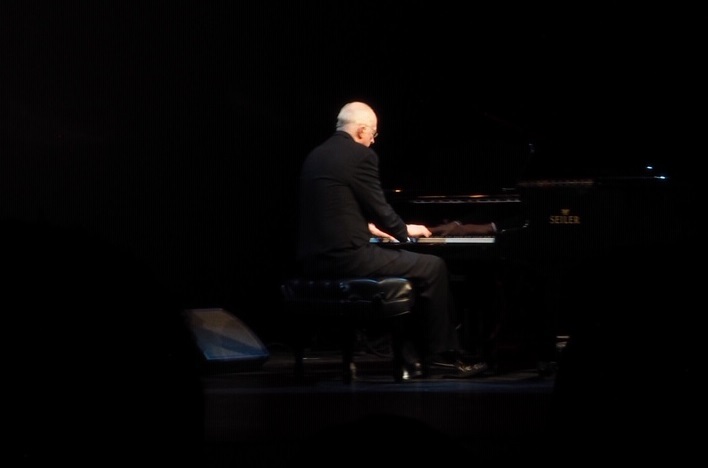 Robert Attfield, an older gentleman decked out in a full suit and bow tie, and who had never before performed on stage, played a classical piano piece. Next was singer and mom of three, Holly Sewell, who wowed the audience with a combination of singing and yodelling. With just three of the previously announced finalists remaining, Renwick switched gears to introduce Amy Wright, the judge of the Young Stars competition earlier in the day. 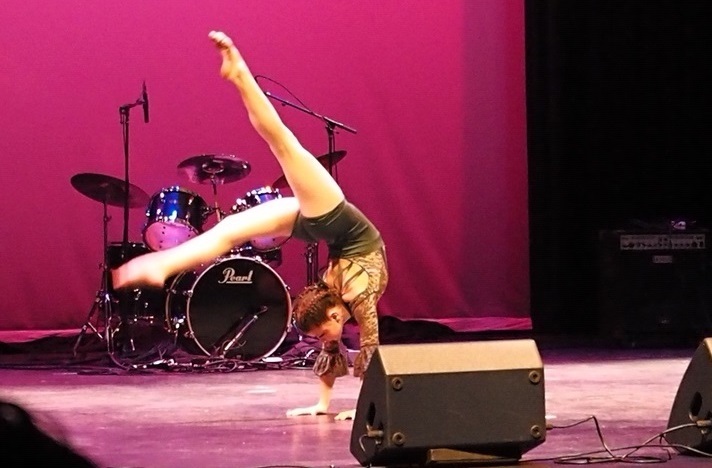 Two were selected to perform—10-year-old Nyiah Blacklock who performed an acro/contemporary dance piece and 11-year-old Caleb Houser who played a Beethoven composition on the piano. Following the Young Stars, Luke Murphy’s powerful theatre piece was followed by Jack Nickalls and Josie Robinson performing R&B tune Misty Morning, and Zack Fitzsimmons, a returning HGT competitor who has personal experience as a patron of Community Living, with the John Denver classic Take Me Home, Country Roads. While the judges deliberated, Community Living Huntsville’s All Abilities Dance Troupe, one of Huntsville’s favourite performing groups, danced to a mashup of Survivor and I Will Survive complete with 70s outfits. Following the performances, Community Living Huntsville’s board president Deb Davis and acting executive director Suzanne Willett announced that with funds raised through community initiatives, including Huntsville’s Got Talent, they have been able to launch the Pathways Program to support people over the age of 18 who don’t meet the requirements for support by Developmental Services Ontario. And then, finally, the moment everyone had been waiting for: the winners. Jack & Josie took third place, Luke Murphy was second, and Robert Attfield was the judges’ favourite in first place. After accepting his trophy, Attfield told the audience that he would be donating all of his $1,000 prize to Community Living Huntsville. If you missed the show, you can watch it online on the Huntsville’s Got Talent Facebook page here (part 1) and here (part 2). Stay tuned for an announcement on the total funds raised at the event. I have the privilege of working with Bob through music at Trinity United Church, and I feel he is so worthy of this honor. Congratulations to Bob Attfield a gentleman, artist and a scholar and above all the kindest person you will ever meet. His music is like himself, dedicated, passionate and inspiring. What , no Bagpipe Solo from Dr. Drew ? Next Year ! Feel free to drop us a line at [email protected]online.ca and tell us how we are doing, what you would like to see more of, or to just say ‘Hi’.